Glock just quietly released yet another pistol, albeit with a catch — the company’s latest offering is exclusively available to US Customs and Border Protection, and will not be available on the commercial market for civilians to purchase. This new pistol was announced as part of an $85 million dollar contract signed with the CBP which will see the largest federal law enforcement agency under the Department of Homeland Security shed its current standard sidearm, Heckler & Koch’s P2000 in .40 S&W, for a trio of Glock pistols chambered for the 9x19 mm Parabellum round. Officially designated the Glock 47 (or G47), the gun is a functional blend of a few of Glock’s other products which the company hopes will give CBP agents a distinct advantage when in the field, should they need to draw and fire their weapons. The G47 uses a 4.5 inch barrel, the same used on the company’s first full-sized pistol, the Glock 17. It can feed from a standard G17 double-stacked magazine with a capacity of 17 rounds, or from G19X, G34, and G45 magazines should the need arise. 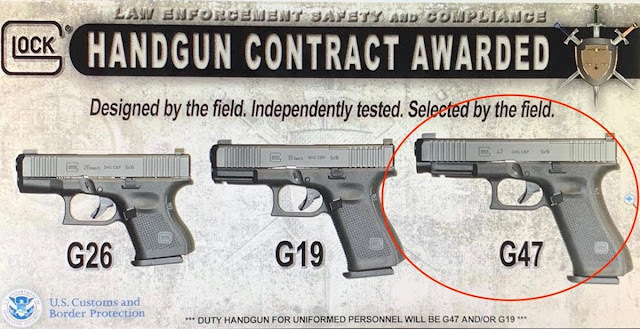 According to The Firearm Blog, although the G47 uses a G17 barrel, the G17 slide is not compatible with the new gun. However, the end user can swap the G47 slide for the shorter G19 slide on preference. The only thing even mildly interesting is the fact that the G47 can use the G19 slide. But that's just the G19X. Make up your mind dudes. Either buy the G19, G19X or the G17. This G47 is vanity and hubris mixed with a big dose of arrogance. I don't see the utility and can't think of ANY tactical sense this gun makes.